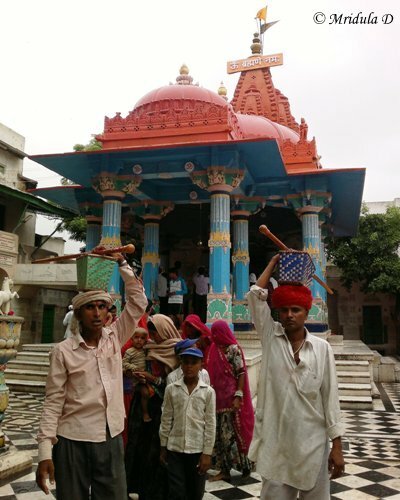 Pushkar is famous both for the Pushkar Sarovar and the Brahma Temple. 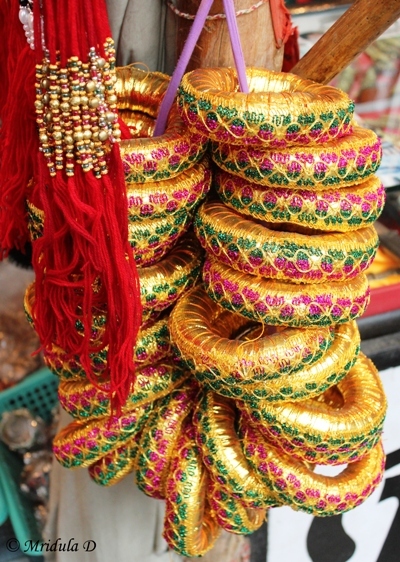 It is also well known for the Pushkar fare but I never got an opportunity to attend it till date. This was my third visit to Pushkar. It is a really special place for me because Chhavi and I have visited it together earlier. 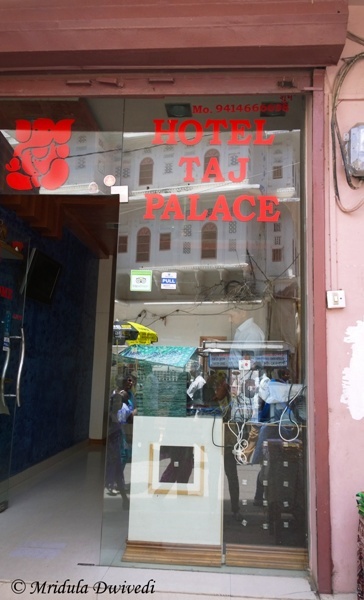 This time I was the guest of Pratap Palace in Ajmer. Pushkar and Ajmer close to each other. Once again no cameras are allowed within the Brahma Temple but cell phones are allowed. So all the pictures clicked in this post are from the Lumia 1020. 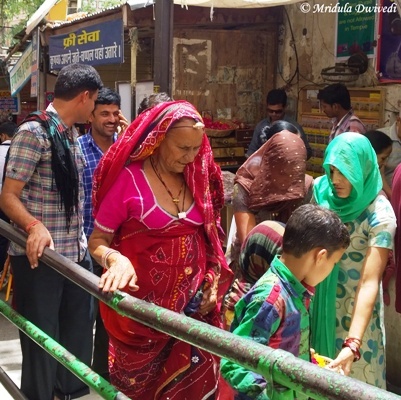 This post is an attempt to show you Pushkar in pictures. The custom says that you need to visit the lake first and then go to the temple. The idea is to wash your hands and feet in the lake, or better still take a dip and then go to the temple. In the evenings it is very pleasant to walk around the lake. The sunset from the lake is spectacular too. 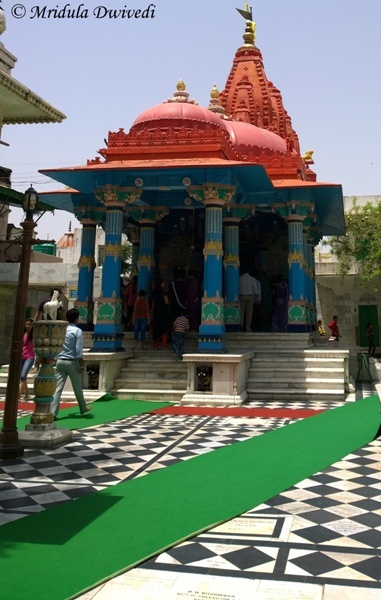 The Brahma temple at Pushkar is one of the few temples of Lord Brahma in the world. There is an interesting story behind it. It is said that Lord Brahma wanted to do a yagna and he needed his wife, Goddess Saraswati to perform the ritual. She took a lot of time in getting ready and the auspices time for the pooja was getting over. 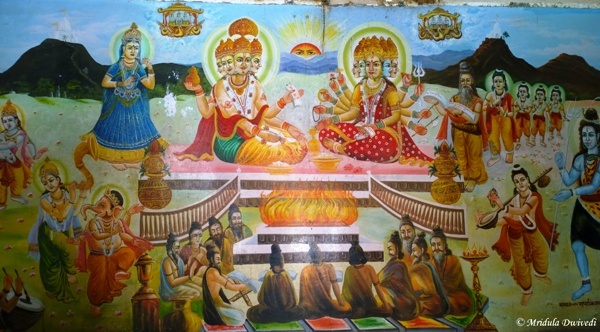 So Lord Brahma married Gayatri to complete the poja. When Goddess Saraswati came down and saw another woman sitting behind Lord Brahma she cursed him saying no one would worship him anywhere except at Pushkar. And hence there are hardly any temples devoted to Lord Brahma across the world. The mural if you notice depicts the same story. Photography is frowned upon within the temple premises. There are notices saying no photography but it is tolerated at the peripheries. To go to the temple you have to go barefoot and you cannot carry anything else but your cell phone. Not sure if you can carry a wallet or not but ladies handbags are not allowed. There are stairs that lead to the temple. I have seen no accessible route. 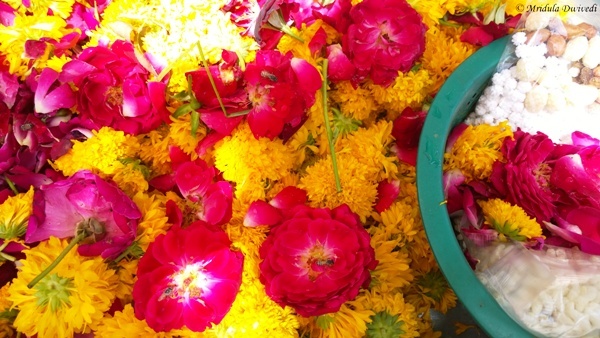 The flowers are meant as an offering to the Lord Brahma. They give such a colorful look to the place. 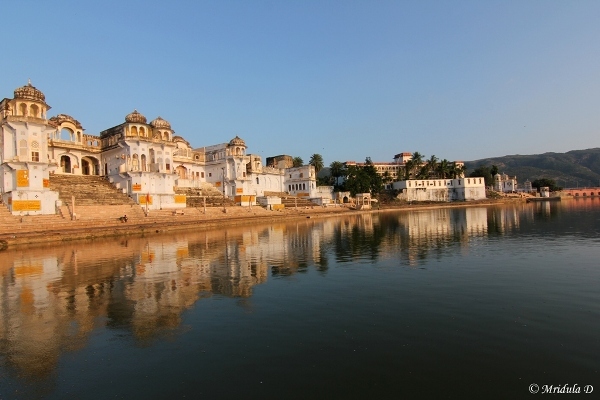 Pushkar is a small city where you can walk easily around the temple and the lake area. What catches the eye are the colors. If you look at the lane, the lady in yellow lends such striking colors to it. 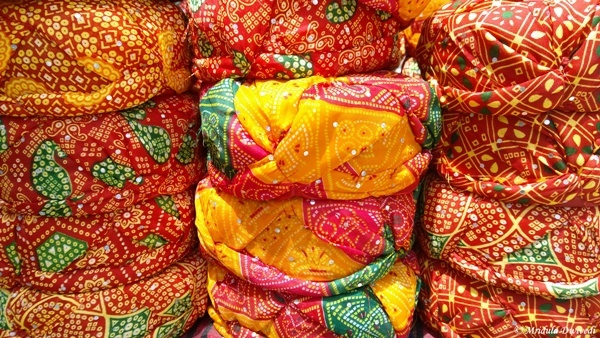 Then the Rajasthani Pagdis (turbans) for sale are colorful as well. When Chhavi and I were here I took her picture wearing one. Shopkeepers ask for a small amount of money to lend you the pagdis. While walking to the sarovar (which means lake in Hindi) I saw not the Taj Mahal Palace with shutters and all! I wonder what the real taj Group would think of this? 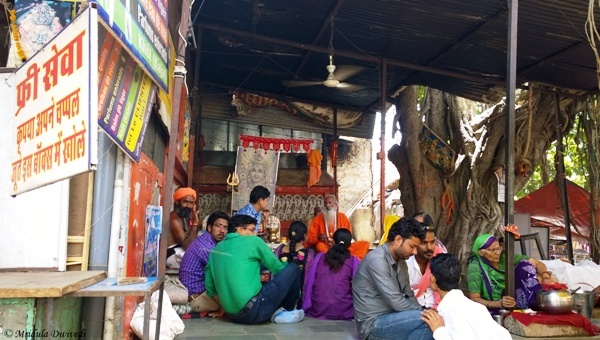 Quite close to the temple I saw this gathering under a banyan tree. One day I guess I wish to go there and sit with them! I wonder what conversations would follow? Even after so many visits to both Pushkar and Ajmer, I guess I will happily go back again! Pushkar Lake (Rajasthan, India) is a beauty, more so at the sunset. The sunset can be seen from the lake and everything around it becomes even more magical. However, the lake itself could be better maintained. As of now the ghats are dirty. The water too looks green and full of algae. 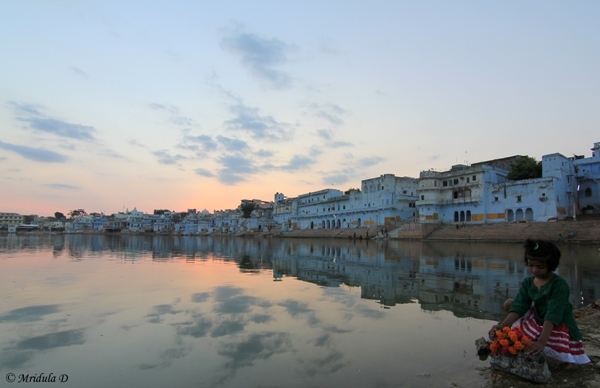 Pushkar Lake is of religious significance to the Hindus so on the main ghats you can walk only barefoot. I got serene blue skies in the late evening. The lake by now was a beautiful mirror. Sarovar means lake in Hindi and the banks are known as Ghats. The lake attracts a lot of tourists both pilgrims and people who are there just to enjoy its beauty. I belong to the second category. Many Hindu priests would ask you if you would like to perform a pooja (prayer) by the Pushkar Lake. I have always declined and the pandas (priests) have never troubled me. 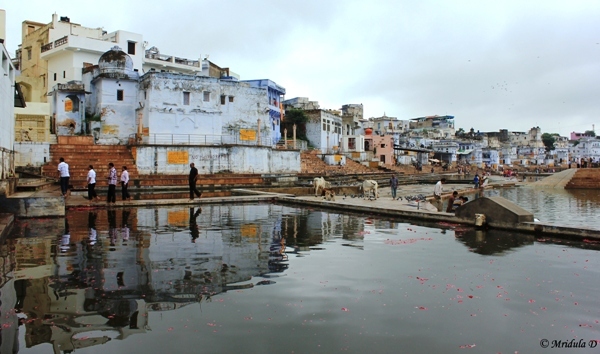 I have been to Pushkar Lake twice. The lake’s origin are traced back to 4th century BC as it has been depicted on coins from that era. Otherwise according to the Hindu Mythology it is as old as creation itself. 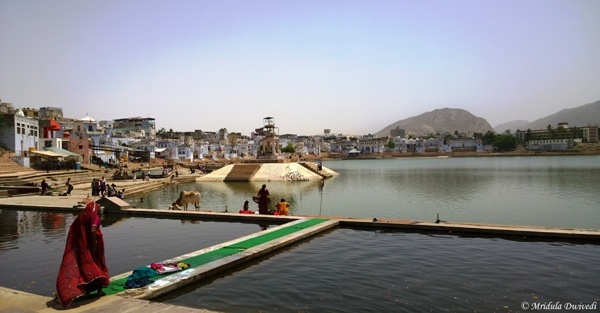 Pushkar has a temple devoted to Lord Brahma and this lake is also said to originate from his lotus petals that fell on the ground in a fight with Asuras (demons). The water of the lake is said to have healing properties. For me the trip was doubly special as it was the first daughter-mom trip! We had a great time and I am already planning the next trip with her! She hates posing for the camera and with great difficulty I manage to click a few decent pictures of her. When the good folks at Sewara Hospitality asked me if I would like to visit their Pushkar Resort I was quite happy. I picked up the long weekend due to Eid as my date. I was taking a Volvo to Ajmer from Bikaner House. I was traveling with Ambica from The Humming Notes. The weather was awesome but as soon as we approached Rajiv Chowk (the Gurgaon one) we realized that the traffic was diverted because of Eid. It was a long detour and we reached quite late at the Pushkar Resort in the end. 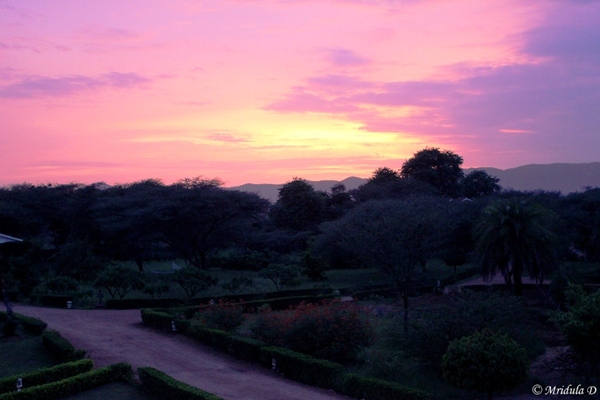 In fact this was the evening sky at reception when we did the check in. Both Ambica and I were longing for tea. And tea with pakoras was the first thing we had. Ambica enjoyed mirchi ka pakora whereas I attacked the other deep fried stuff. Both of us were forced to skip lunch as the bus never stopped for lunch. Before I could even blink, it was time for dinner. We enjoyed the Indian food buffet with a glass of wine. The resort is spread out and each cluster has a few rooms around a lawn. These were our rooms. After dinner all I wanted was to crash but somehow sleep eluded me. I slept after 11.30 pm in spite of being quite tired. And yet magically I woke up at 6.15 in the morning. It was completely overcast hence there was no sunrise for me. 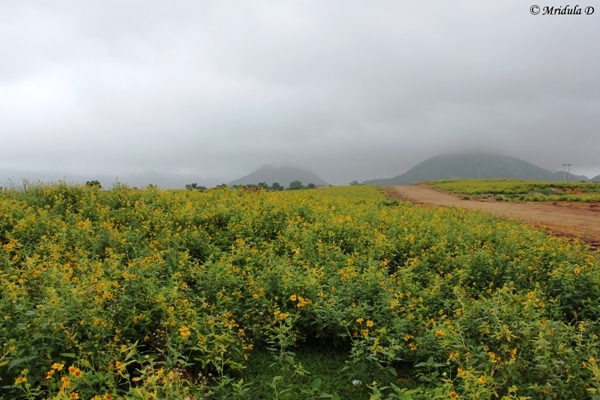 In fact, the clouds were hanging so low that it gave the impression of a hill station rather than desert city! But I was still happy as there were so many birds at the resort! 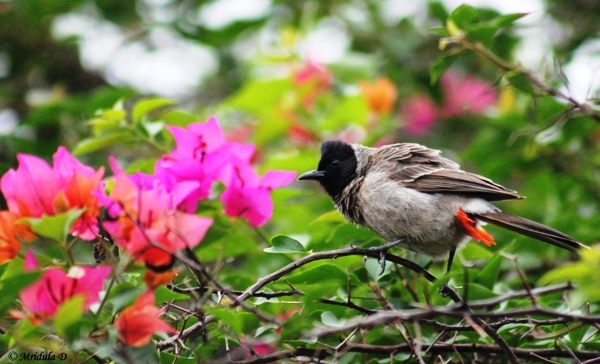 I will actually do a separate post on the birds I clicked at Pushkar Resort. In the monsoon the place was so green. 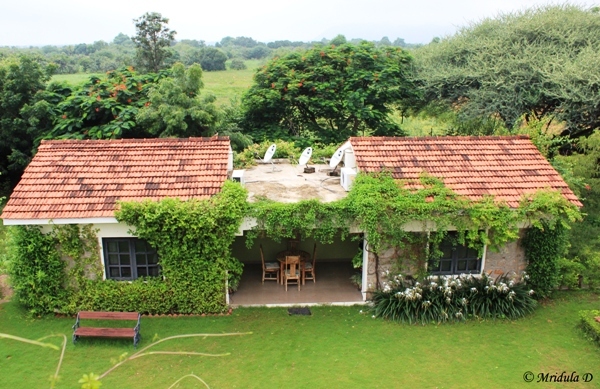 I looked at the swimming pool but decided to give it a miss in the end as we were going to explore the Pushkar City in the morning and then head for Lakshman Sagar. After breakfast it was time to head out to the city. 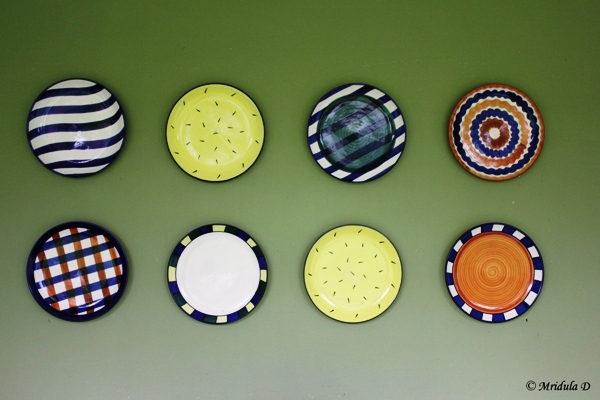 Before going I decided that the pottery on the wall was really pretty and it had to be clicked. It was a short but nice stay at Pushkar Resort for me. While coming into the city I had taken notice of this field. I was determined to stop and click a picture on our way back. And as I said Pushkar had such a hill station feel to it during my entire stay. 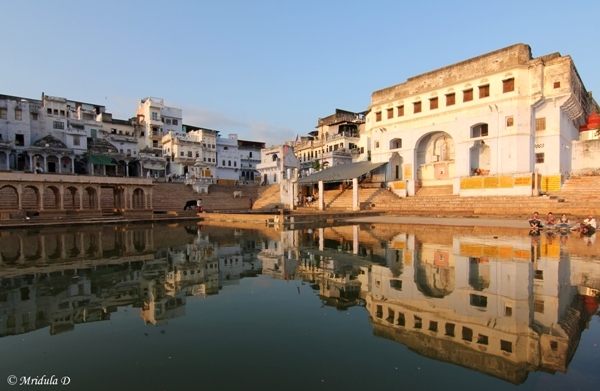 Pushkar is a small town which has a sacred sarovar (lake) a renowned Brahma Temple and a small market apart from the famous Pushkar Cattle Fair held yearly. Our first stop was the Pushkar Sarovar. People try to rope you in for a pooja as soon as you enter these parts but they are not too pushy. After a few firm nos we were left alone to walk around the lake. As the lake is sacred shoes have to be removed. There were pigeons flying around the place. Cows also consider the space to be their own. Prayers were being performed at various ghats. Add to this scene a wet surface due to the rains and the picture is almost complete. 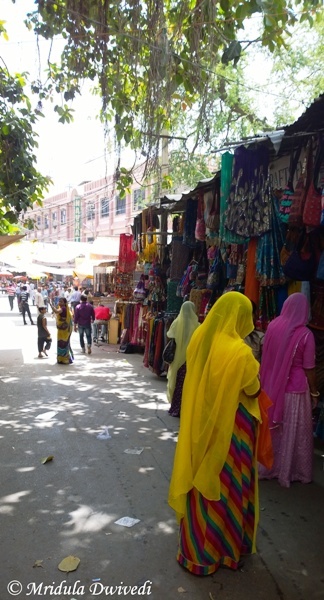 Pushkar has a small market on the outskirts of the lake. It sells all things shiny and we strolled there for a while. I cannot go home without buying something for my daughter and niece (generally nephews and sister too) so I bought lehengas for them. I would have liked to stroll for longer but we had to visit the temple, stop at Ajmer Sharif Dargah and head to Lakshman Sagar all in the same day. Our last stop at Pushkar was the Brahma Temple which is said to be most prominent Brahma Temple in the world. I am not strong on mythology but the present Jagatpita Brahma Temple dates back to 14th century and the original was 2000 years old. I am not particularly religious but it is fascinating to see the faith all around. They let you take only your cell phone and wallet inside the temple and nothing else. There are lockers for safekeeping but Ambica and I took turns to go and watch the handbags we carried. So the picture above is from my cell phone. After this we were headed to Ajmer to visit the Ajmer Sharif Dargah and then continue to Lakshman Sagar.